Stranger Things will use Unity, sources say. Telltale is making the move from the creaky Telltale Tool to Unity, unnamed sources told Variety. The switch has been long-rumoured thanks to a job listing for Unity engineers back in January. It’s probably overdue, as the engine has been around since 2004 and, despite improvements, hasn’t aged well. 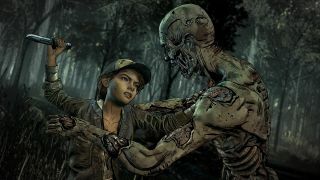 The Walking Dead’s final season will fittingly be the last game for the old engine, while the Stranger Things adaptation will be the first Unity title, the sources say. Take a gander at The Walking Dead's E3 trailer below. It’s ostensibly good news. Unity is a flexible, popular engine, while the Telltale Tool has been unable to keep up with changes in game development. It took 12 years before it got a physics engine, for example. Still, the studio has made the most of the Telltale Tool, and The Walking Dead’s closing season looks like it will be pushing it further than ever. The last season of Telltale’s Batman also looked considerably fancier than most of the studio’s titles, especially when it came to the elaborate QTE action sequences. The old engine may have cost Telltale. According to Variety's report, one idea from people inside the studio was to stream the Game of Thrones adaptation to subscribers of HBO Now, tapping into its massive audience, but the Telltale Tool engine reportedly couldn't support that. Despite the shift to Unity ultimately sounding like a positive change, it’s not been problem-free. There have been some “growing pains”, Variety reports, and development is taking longer as the developers learn how to work with new tools. The first episode of The Walking Dead's final season is due out on August 11.